This cult-classic sci-fi spoof arrives in San Diego for its concert world premiere just in time for Comic-Con! Stars of a 1970s sci-fi show are beamed aboard an alien spacecraft and join the aliens in their quest to overcome the oppressive regime in their solar system. Academy Award® nominated composer David Newman conducts the San Diego Symphony performing LIVE at the Jacobs Music Center's Copley Symphony Hall the score he wrote. 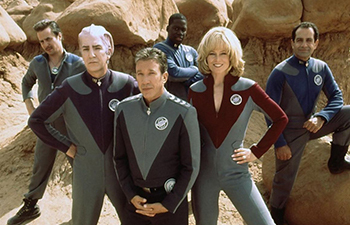 Galaxy Quest™ in Concert is sure to delight and boldly go where few parodies have gone before! GQTM & ® 1999 Dreamworks LLC. All rights reserved. This concert takes place at Copley Symphony Hall, Jacobs Music Center.